Welcome to the first episode of a possible new series from Pastel Games, the masters of short, atmospheric point-and-click adventures. With a story conceived by Karol Konwerski, The Scene of the Crime takes us into the sleazy, blood-stained world of detective novels. Kind of a Great House Escape as re-imagined by Frank Miller. In a world so noir that sunshine has been legally replaced by ominous street lamps, you play the part of a detective on a murder case. Rather than track down the perpetrator yourself, your job is to collect evidence and put together a case for conviction. Point and click your way around the grisly crime scene until you've ticked off all the necessary plot points, and then leave the apartment to conclude the story. Access your briefcase full of forensic tools through the icon in the lower-left. There's a nice physicality to this, aided greatly by Kamil Kochansky's thick, twisted visuals. The fiddling with forensic tools, the clump of your footsteps as you explore the apartment, the syrupy background saxophones by composer Kolczok—it all puts you in the scene. The adventure is short, just a chapter in the saga, but even so, there's a feeling of disconnect between the vibrant cutscenes that book-end the story, and the gameplay itself. It might have been more effective to sprinkle parts of the (surprisingly violent) closing scene throughout the game as you discover details, CSI-style. Even with the shortness and schizophrenia, this is a promising dark new direction for Mateusz Skutnik and crew. Step into the gumshoes of a new hero and explore. 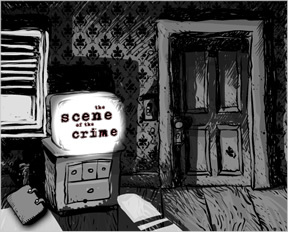 The Scene of the Crime Walkthrough now available! Here's a nice little walkthrough for you, told again in story form. It's not as long as the LAST story-through that I wrote (Desert Bridge), but it's pretty good, if I do say so myself. It's dark and the rain's falling heavy. I've been following this case for weeks, but, right now, all I can think about is how bad I want a smoke. That lighter's weighing pretty heavy in my pocket. Life's a real riot, and the way I see it, there ain't a good reason why I shouldn't cut it short. Short enough to not let the collectors get the last laugh, but not so short I can't show off my skills. That's why my lungs are as black as the city's underbelly. What are my skills, you ask? I'm a private eye. My job is to put my nose where it don't belong. There's a lot that don't belong in this town, and a P.I. is just that. Or so the big boys say. Lights flicker from a single room on the top floor, mingling and dancing with the lightning. Man, do I want that cigarette. I storm the room, gun raised, eyes wild as deuces. Cards were never my thing, but if I were as good at that as I am at snooping, I wouldn't be a snoop. If there's a God out there, he's got a sense of humor, but I can't call him unjust for it since I'm here, or much else for that matter. People are always quick to put off the blame. My bad credit ain't no one's fault but mine. Room's empty. Another light flickers from behind a door. I go in. It's the bathroom. A man's arm is hanging out of the tub. Everything else is hidden in the shadow of a torn down shower curtain. I examine the body. The man was 30 years old, dead from a stab wound. The water's dark from the blood and the shadows. The man was just leaving his prime, might even have had a decent life. Poor guy. Either he died from a mistake, a psychosis, or maybe even greed. But all of that's the pity talking, and I shake myself when I remember where I set up shop. Chances are this guy had it coming. I notice the man is wearing a watch, for whatever reason. Strikes me as odd, but I've forgotten to take off my ticker in the shower once or twice. Makes me glad I bought one that's waterproof. The thing had stopped at 8:03 PM. Must have been when he died. I step away and start looking around the bathroom. It's dank, rank, and tiny. Reminds me of my own apartment. There's a newspaper lying next to the toilet. The headline reads something about a woman winning a hundred grand. Lucky dame. I drop the paper and check in the top of the toilet. They say they quickest way to a man's heart is between the third and fourth ribs. Well, I found the vehicle that got the murderer there: A blood-stained knife. I check around the sink next. There I see the one thing I was afraid I'd find: lipstick. There's always a dame involved, and I've never dealt with one that wasn't crazy. I'm really lucky if she has a genuine case and isn't trying to set me up. I don't trust the brunettes anymore. There's a lot of bleach sitting next to the sink. Pretty obvious that someone wanted to cover their tracks. Ther's also a crumpled up piece of paper in the trash. Turns out to be a threat letter written in magazine cutouts. Whoever this maniac was, they didn't even have the decency to write their own threats. Days like this, I hate my job. I'd found everything I could in the loo, so I step out into the apartment. The TV's glowing, but the only thing on is static. I turn to my right and find this end of the room ransacked. Someone had already searched the place, but that doesn't stop me from doing some searching of my own. Under the foot of the bed I found a cell phone. Could be useful if I could see the old messages, but the battery is missing. At this point in life, so's most of my soul, if I ever had one. A set of closed drawers on the left side of the bed seems like the next best place to look around, but there's nothing in them. But there is a strand of hair on the bed. Blonde. I must be losing it. One last thing to check before going to some other moldy corner of this rundown place. I lift the picture above the bed off the wall and discovered a safe with a hundred grand inside it. Could this be the same 100K mentioned in the paper? If it is, then it must be at the center of this case. It would definitely explain why the place was such a wreck. I turn back and check around the TV. In the drawers I found a cell phone battery and a small notebook with a page torn out. My gut tells me I have some more sniffing around to do, and I'm never one to argue with it. That's why most of the money I make goes to bourbon instead of the bills. On top of the picture box is a set of car keys. I bet somebody's in the trunk of a car somewhere. Or some body. Either way, I'm not gonna get much sleep tonight. Behind the TV, I found a bullet. Something else bad happened here. With my luck, I've got two murders on my hands, as if they weren't dirty enough already. To take down crime, sometimes you have to do a few illegal activities yourself. Things you see in this line of work toughen you up. Or maybe they just wear you down so much that you're just too tired to care anymore. After a while, the only things you care about are the things that kill you. You make a living, stay alive just so you can spend all your money on a kind of death or two. Pick your poison. One's wrapped in paper, the other a bottle, but I haven't found a reason why I couldn't have both. But you know what the real tragedy is? If either of them is making me happy, I can't tell. I turn left to face the wardrobe. On the left side is a picture of a blonde dame who looked a lot like the one in the paper. It's comforting, but I don't know why. The right side of the wardrobe doesn't have anything I can use in it, but the left side does. I found the man's wallet in his coat. Inside that was a receipt from a restaurant, timestamped about 5:30 PM. Looks like he had lunch with someone, and I doubt it was his wife. There's a suitcase at the bottom of the wardrobe. I open it up and take a peek inside. Somebody was packed and ready to go. Since when do kidnappers kidnap people with a full suitcase? Something was starting to stink worse than the body. I went over the place again and couldn't find anything else, so I decided to leave and call it a night. But blazing crimson on the door frame was a spot of blood. Just my luck, this all but confirmed that there were two murders. It's time to put the pieces together, and what better way than with the cell? I plug the battery in, but the thing tells me that I need the PIN. The notebook had some embedded handwriting from the torn out page, and my trusty pencil's never failed me yet. A little scribbling and the PIN is mine. There's a new message from 7:30 PM. Martha must be the blonde. That was probably her blood, too. The threat letter said to bring the money at 7:00 PM. The picture is getting a little less fuzzy. Next, I dust for prints. Using the brush and the dusting agent, I discover two prints, one on the knife and one on the lipstick. Why am I not surprised? The bullet is clean, though. I compare the prints. No surprises again, they're a match. I bet she's a brunette, too. After reading over the letter and my notes, everything comes together. I can leave now, knowing I've solved another case and made the world a little brighter for someone who cares. I'm at the same place you are....one more clue. the wordrobe/suitcase full of clothes? The pin number is different each time I think. I'm replaying it. Go into your briefcase and use the pencil on the notepad with the page torn out. The PIN is different every time. The one "hard to find" object is behind the TV. As someone who is a professional walkthrougher... and who greatly enjoys the works of these crazy Pols... I was a bit disappointed in the difficulty of the game. But I look forward to future chapters. While the left wardrobe door is open, click on the hanging jacket and get the wallet out from inside the pocket. Wonderful! I actually finished this one by myself! Games by the Pastel crew are always ones to look forward to. Nice style, the changes in light through the windows is a really good touch. Is part of the mystery working out why the bathroom is triangular? The fact that you had to get to that view from the main view of the room just threw me off a bit. But yeah all in all a great game, if a bit short. Matching up the two fingerprints. It's the type of game I expect from Pastel. Never been a fan of this type of drawing/artistry. But these games always deliver a quick fix. Wow, what a sick woman!!! the cel phone. I took the battery and put it on the wallet and it vanished, but I can't figure out where the cel phone is. Somewhere in the wallet, maybe? when you're zoomed in on the tv it has one knob, but when looking behind it and on the main view it has 2? Did you check all of the standard point-and-click locations? entirely. I had picked it up and clicked on Exit, I heard a tone and then it was gone. Very interesting. The ending cutscene was visually uh... intimidating. I wouldn't call it pretty, but very well done. All of the blood, the gun shots, the stabbings.. wow! Interesting concept too, reminded me rather of an old Carmen San Diego game for the PC, only a bit more gruesome. The same thing happened to me, but the phone still worked once I found it. whenever someone is murdered, their watch is stopped, presumably at time of death? While I'm sure he put up a fight, his watch wouldn't necessarily be broken, especially since there are no wounds on his arm. why did the murderess not take the money with her? Also if she had to hide it why hide it in the safe in a hotel room where you just killed your lover and his wife? Not very good at crime! well that was awesome only needed help for the last clue. Can't wait for the next one. It scared the HELL out of me when I went back into the bathroom and the door clicked closed behind me (!) I would never have suspected so much violence, but I got through without hints so that's always a good game for me. HOW did Martha's body get in the trunk? Is there someone else involved? The wife back from the grave? Why would the mistress kill them both and then LEAVE the money in the safe!?!? the artistry was good. the music was good. to the ending, I'll give it a 8.5/10. this is a POSSIBLE series. I'm not saying it will turn out into something like the great escapes. would you like it to? Once again, the master delivers great enjoyment. Perfect game for a rainy day, especially with a little soft, slow, bari-sax jazz playing. really killed the mood. Other than that, though, thoroughly enjoyed. Onyx Mouse, Mateusz just did the programming and a bit of the art. Everything else is down to the other Pastel Games members as named in the review. Awesome new direction, too. So it really is a new series? More to look forward to, then. I particularly liked the visuals - the scribbly style complements the grim mood. Hell yes! I'm re-reading Chandler's novels at the moment, awesome timing. Philip Marlowe is the greatest dude ever, and so is anything even remotely associated with him or his legacy. It was too easy though. And the story was very rushed, it didn't give you any info at the beginning (even the stuff your character obviously knew) so it was hard to fill in the gaps. Nice art, as always from Mr. Skutnik. Martha's the wife. Anna (the mistress) probably hid her body into the trunk. the mistress left the money and why the car keys were on the TV. Still, this is a very good and atmospheric game. Hoping to see more in this series! I think I can explain some of the plot holes. 1) The watch: Like I said in the walkthrough, maybe he just forgot to take it off. Might not have been waterproof either. 2) The money: Anna probably didn't know about the wall safe in the inn room. Reilly met her there. She probably left to take care of Martha's body and it was then that Reilly made his move. He had probably planned to keep the money for himself and so hid it in the wall safe. 3) The keys: Continuing from the previous entry, Anna returned after a few moments and found that the money was missing. She left the keys on top of the TV and searched the place before grabbing a knife and killing Reilly in a fit of rage. Not knowing what else to do, she hid the knife in the toilet and ran. She had already abandoned the car with the body and it wouldn't be safe to take it. This is a really good game. Yes, there are gaping plot-holes, but the atmosphere and music is so captivating that it's brilliant. First the Fog Fall, now this, this is a brilliant new direction for Pastel Games. Who commits double-murder for 100 Grand? That's only 50K a pop. Especially when the guy was already married to the woman who won, and the mistress was getting wined and dined on his dime anyhow. That has to be one of the least thought out "masterminded" crimes I have ever seen. I guess I liked it because I'm a sucker for noir detective games. Take the Case of the Crabs or the Goat in the Grey Fedora for example. Obviously, they don't need to have a strong plot since they are meant to be silly and funny, but as soon as I see the black and white pictures and hear the soft jazz in the background, I get too excited to care about the plot. i hope someone will put a walkthrough that is not in story form. these confuse me. lol. The plot probably isn't meant to be taken all that seriously; the fun is in finding everything out in the first place. And these days, it's not a crime drama unless it's some ridiculou scheme. Love finding the clues, it is interesting to try figuring out what happened while clicking everywhere. Though there is several drawbacks, like how to access the back of the TV and the plot is senseless. Murderers aren't the most bright minded people but theirs motive almost never fade in. If they murder because theirs greed, they will never left the money, even if that means he/she will kill 100 more people. Am I the only one who noticed the rain in the intro? it was pouring down, but the camera was obviously at the top. The rain should have been... uhm.. what do you call it? circles that gets bigger or something. But is it rain? might be tv static or something. Excellent twist at the end, no? Couldn't believe the double murder thing. great game, can't wait to see what comes next! Although, as trained detectives, we had no trouble with it. Is someone working on a step-by-step walkthrough yet? Just curious. i am never good at these but even with a walkthrough i enjoy them! Anyone else having problems with this game? Once I click on a clue and it goes in the note pad it disappears and then the cycle keeps going. I had a problem too. I opened the notebook, got the fingerprint brush and dipped it in the dust. Then I couldn't exit from the notebook. The brush was stuck to the cursor, and no matter where I moved it- even if the exit arrow was lit up, I couldn't get back to the game. at first the husband's name is Jason, but when he gets killed, he's referred to as Ben? then Martha took the money to Anna's hotel, where she was shot. Why would Anna bring the money back and leave it in the safe after killing Jason/Ben? Anna left her lipstick in Martha's bathroom, since the lipstick fingerprint matches the knife print. a bullet have ended up behind the TV set, if Martha was shot at Anna's hotel? Here's what I think really happened. The real killer is Martha. Anna's body is in the trunk. The lipstick was Martha's. How could it really be Anna's? She would have had to leave it on the bathroom counter after killing Jason/Ben. Who puts on lipstick at the crime scene after killing someone? I don't think it could have been left over from a previous stay because it was in plain sight, and Martha surely would have noticed that it wasn't her lipstick. Martha left the money in the safe. Her husband, the man she loved, had been prepared to kill her for that money. She didn't want it any more. So I don't have to explain things later, I'm posting now that I put my walkthrough up on DeviantART. I played this game 2 times, the first time with walk-through, then maybe a year or some months, I played it without a walk-through... But I got a tip to get my last clue, saw the blood after then, okey-dokey I go through the cutscene again. After playing two times I GET IT!!! I wish they made more of "The scene of the crime" games! But I totally agree about the ending making no sense, as much as I love the game.